Just kidding with that title. Everything is going fine! The turkey I put in on the patio because I can't fit it in my fridge did NOT get eaten in by woodland creatures in the back yard. (Hang on . . . . Okay, checked again and it's fine!) There ARE really the same number of linen napkins I sent to the dry cleaners last year perfectly pressed, ready and stain free for this year! My brother and his family did NOT cancel and they are making a long journey here for Thanksgiving. I'm so excited! But there was one mishap that cost me quite a bit of planning time. I don't want it to happen to you, so I'm sharing my tips. The problem? A wrinkly, wrinkly table cloth. 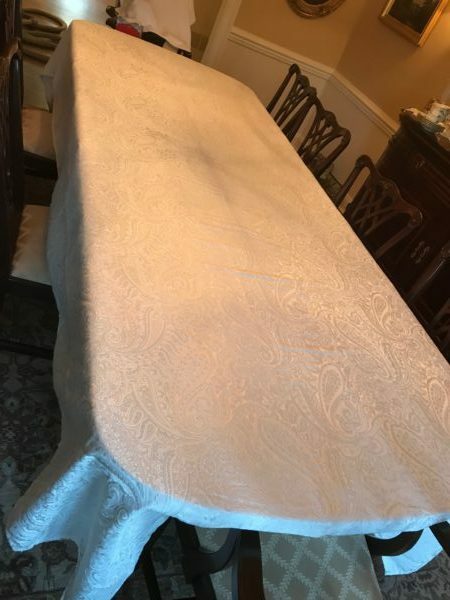 It turned out that the beautiful linen tablecloth I had dry cleaned and pressed after last thanksgiving is somehow too short for the table. Did it shrink? Do we have another leaf in the table? Did we just use a too short table cloth last year? (My totally reasonable spouse says to this last one, "Remember, we can IMPROVE on what we did last year," when I suggested we-did-it-before-we-ca- do-it-again. I love him dearly, but the impulse to just throw him out the window briefly washed over me. Then I remembered that we-did-it-before-we-can-do-it-again time is Wednesday night at the earliest, and this was on Saturday.) So, I decided to buy a longer tablecloth. I could only get a longer one that is polyester. The thing about polyester is, it can be wrinkled -- especially fresh out of the neatly folded package. And because it is synthetic, you can't just put the iron on high like you would with linen. Before you scoff at my obvious bluff about knowing anything about an iron (it's true my 15 year old son irons his own pants because I kept promising to do it until he grew out of them -- it was strategic procrastination!) I did iron the linen one last year. Or I "let" my husband do it, TBH. So this year's snafu was how to get the wrinkles out of this polyester tablecloth. I went to the internet to find my answer. Of course my go-to Martha Stewart, had nothing to say non-natural fibers (sure, she can shotgun a Coors with her new friend snoop dog, but she's still kind of a snob.) So deeper in the weeds (Howcast has an informative video, but seemed like too many steps, Ever After Guide was similarly a similarly time consuming process.) I found my answer way down at the bottom on a bulletin board thread on a wedding prep site. I can't find it again, but a lot of people had different ideas, and the one that worked for me was kind of a hybrid of all of them. Here goes. Steam was the trick! I put my iron half way between the settings for synthetics and wool, turned the steam setting to high and went for it. I should explain I was ironing on the dining room table, which has those protective velvet on the bottom/plastic on top pads. So I also put a really plush towel underneath the section I was ironing so things didn't get melty or any other disaster. (I said the cursed thanksgiving title was a joke, remember?) It looks great! Now I just have to check on that Turkey and we are on track for a curse-free Thanksgiving. Not counting the words that may or may not come out of my mouth. Plus, I found a heart shaped potato, which I think is a good omen.